Never raised chickens before, & here, April 30th, my son brings home a bird that he won at a local science fair...the bird, he named "Crow" is fresh out of the brooder, & is pretty freindly, & loves to sit in my lap as I type away on the keyboard of my laptop...Seems to me that she's gunna be a good companion, & hopefully doens't befall the fate of the other 25 birds from the science fair that was held, as I know that the dogs are gunna get them, as kids aren't too kind to animals, & paren'ts aren't going to pay for food to feed birds. I start to build a coop for Crow, & come to find out that she was ID'd as a BSL, & then later as an Autraulorp. Her coop, I am makin' outta fresh scraps of plywood, & an old wood sled I built. It's comin' along nicely, but it's definatly not much of a goin' concern, & it really looks like a picasso! I find out that someone else wants to give us their hen, as their son isn't keepin' after it, not cleanin' up after it... Music to my ears. I also find that the dump has PLENTY of scrap wood & I make my way down there, & find as much that will fill my sled, & then some...& it's enough for a nice triangular chicken tractor! Woo hooo...someone also points me to this website, & I peruse, & garner as much info as I can, & build some nesting boxes, etc. & await chicken wire. 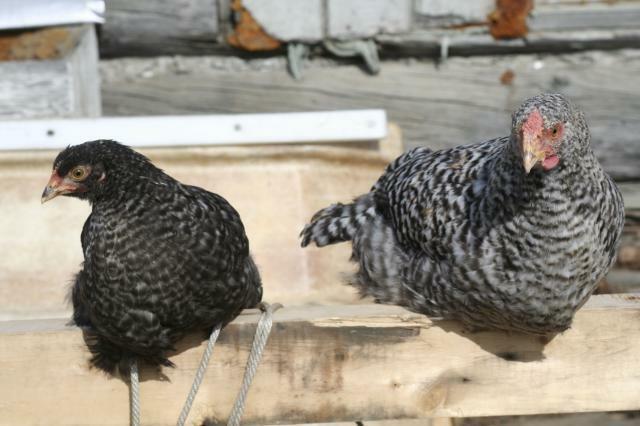 So, I've two hens now, Herminoe, & Crow...& I see that my wife's son has a rooster as well & I put it in her ear that he won't take care of it & should just let me have him...(his bag o' food from the fair ran out, & I just ordered two 25# bags!). He relents & finally gives in...after weeks of pestering! 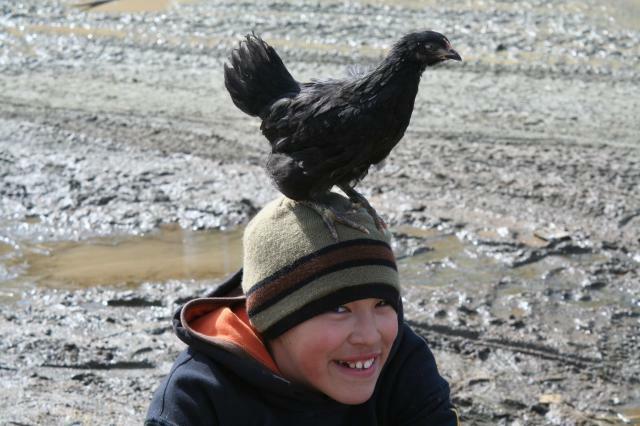 Another week goes by & here, another kid, has a black hen smaller than ours, but in the same hatch, who can't take care of his bird bring down his hen & tries to let her "play" with mine, but they won't have it...peckin' at her, as she tried to eat their food, & they've also a roo to impress...poor girl...I allow that kid to bring her into my house & feed her all alone & she digs in heartily & just a singin' & chirpin' away peckin' as fast as she can, as if she's NEVER eatin' before. I ask him what's he feedin' her, & he says "Hotdogs", I tell him that they eat bugs & grass too, &he says that he'll start feedin' her...(this kid is just like Russel in the movie "UP"...hehehe)He brings her down again the next day & she eats more & more...& this time my two boys take him out & find him some grass shoots & some straw for her house...he brings them up, & says that she won't eat the grass. Now the next day, he asks me if I want her, & I oblige! WOOOHOOO!!! Three hens & a ROO! (So glad I built two nest boxes & a large enough coop!) & I feed her all alone, as she's pecked & pecked mercilessly by Herminoe & Crow! (the NERVE!). The same day, only later, another person who took in two Brahmas, a Roo & hen, asked me if I wanted his, & that he'd get with his wife to ask her...I tell him I've a Roo & would gladly take his hen.